Award winning designer- Gaynor Witchard. A landscaped garden by Ayegardening. I was prompted to write this blog post after I attended a quote the other day for fencing. The client, as recommended, had obtained two quotes prior to ours. After discussing the fencing work with the client- budget, options and materials, the client mentioned that one of the quotes had not been itemised and therefore he didn't even know what fence-type the other landscaper had quoted for. This worried me, as firstly any landscaper should have a discussion about materials with the clients and also it is impossible to compare quotes if you are not comparing the same type of materials. In the past, when speaking with one customer, they had not realised how much a particular paving stone would cost, when we pointed out the costs for different stone types the customer had a better understanding of what they could realistically afford. An 'all in price' from a landscaper is not advisable unless you have already discussed with the landscaper what materials will be used- however, we would still encourage the quote to be broken down. At Ayegardening all of our quotes are itemised so that you can see how the cost breaks down. We also write details of the work to be done. This helps you as the customer, to make an informed decision. More importantly, we prefer to have a discussion with you before we quote: about your budget, materials preferences (what you like and what you can afford may be quite different) and also what you are aiming to acheive by landscaping your garden. While writing this blog I came across an article by a colleague of ours. Award winning garden designer, Gaynor Witchard, has written some useful information on the real cost of landscape/garden design. 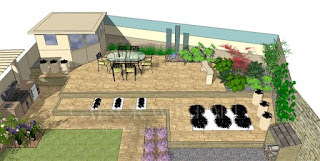 We are pleased to be able to share that information here and hope it will prove useful to you if you are planning to landscape your garden or consult a garden design service. Whenever I’m asked to give a design consultation to a prospective client, I’m always asked ‘How much is it going to cost?’ People often have unrealistic ideas about the cost of building a new garden, or improving an existing one. This may be because of ‘makeover’ programmes in the past giving a false impression of the true cost or the skill and time involved, but more often it’s inexperience. Most designers and landscapers will ask you to define your budget before presenting you with a design or begin any building work. This is not a ploy to ensure they get all your money from you. It is because your budget will influence the layout and material choice presented to you. 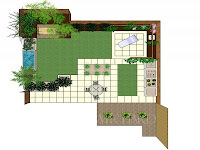 It’s unlikely that that anyone will design and build the same garden more than once, so getting it right the first time is essential not only for your garden but also your pocket. Before you decide to engage a designer or landscaper, think about how much you want to spend. Some designers will tailor their services to your needs. For instance, producing ideas and suggesting garden layouts, rather than the complete design service, may be all that you need. Take into account, however, that time will need to be spent by you or a landscaper in accurately measuring the garden and setting out the design ideas. A specific scaled design plan drawn up by a designer will avoid the need for guesswork, and provide detailed information from which building and material costs can be quoted. Some advice will tell you to allow between five and ten per cent of your house value, but if that’s not financially possible, opt for a partial design or just look to improve what’s already in existence. For example, replacing a tired old patio with modern materials or with a different style can make a big difference. Most designers and landscapers have websites, and some of these also give basic pricing details which will give you a good starting point. Although we all want the best possible service for the lowest possible price, if you look at price alone without taking into consideration skill and experience, then you may find that quality is sacrificed. 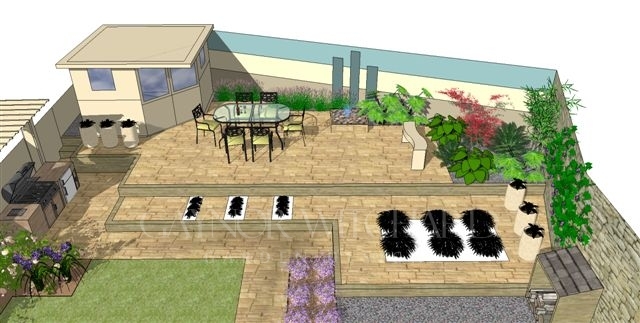 Look at your garden as an investment in the same way as you would a new kitchen or extension. If you plan to sell your house in two to three years, however, then lower your budget so you can profit in the short term. In this case, you will need to build a garden that will appeal to prospective buyers rather than suit your own personal taste. If the garden is for you to enjoy, then make a wish list for your designer or landscaper. What you would like to achieve for your budget can then be discussed honestly. If money is no object, then your contractor can provide a quotation for the work to be done, or ‘tweeked’ to accommodate a design if you have a set budget. Remember that the cost of building your garden is not based on material prices alone - there is also VAT to consider, labour and waste removal. General items like sand, cement, membrane etc, will also need to be taken into account. Then, of course, follows the cost of plants and planting after the garden has been constructed. We hope that you have found all this information useful especially if you are planning some landscaping yourself.